Editor’s Note: This article provides interesting and evocative research. The principle is well researched and the practice was very broad. The findings in Research Question 2 have considerable significance for design of learning. and the research findings from Research Question 4 provide considerable direction for optimal design of effective of learning materials. Innovative educational technologies provide valuable opportunities for educators to design an enhanced, interactive, more inclusive and engaging curriculum. Key pedagogical motivations for utilising educational technologies include the desire to improve learning performance and engagement. Educational technology and access to multimedia have provided opportunities to present multiple representations of key content areas using multimedia (text-based, video, aural, interactive elements) to cater more effectively to different learning styles and model preferences. This paper presents the findings of an experiment to measure the impact of multiple representations of content on learning outcomes including learning performance and engagement. While, in this study, multiple representations of content did not lead to actual improvements in learning performance, students reported favourably on multimodal learning elements and perceived that they had assisted comprehension and retention of the material. Implications for educators, limitations of the experimental methodology and directions for future research are presented. In the field of distance education, traditional print-based materials are being converted to more interactive, multimodal, technology-mediated e-learning formats. Multimedia enhancements include, for example, video and audio elements, recorded lecture presentations, interactive audio-enhanced diagrams and simulations, interactive quizzes and crosswords, and graphics. Multimedia can be used to represent the content knowledge in ways that mesh with different learning styles and appeal to different modal preferences (Birch & Sankey, 2008; Moreno & Mayer, 2007). The concept of learning styles proposes that “different people learn information in different ways” (Pashler, McDaniel, Rohrer & Bjork, 2008, p. 106). Modal preferences refers to the existence of study preferences; that is, “the fact that people will, if asked, volunteer preferences about their preferred mode of taking in new information and studying” (Pashler et al., 2008, p. 106). Multiple intelligences and mental abilities do not exist as yes-no entities but within a continua which the mind blends into the manner in which it responds to and learns from the external environment and instructional stimuli. Conceptually, this suggests a framework for a multimodal instructional design that relies on a variety of pedagogical techniques, deliveries, and media (Picciano, 2009, p. 11). Multimodal e-learning environments allow instructional elements to be presented in more than one sensory mode (Mayer, 2003). Therefore, material presented in a variety of presentation modes may lead learners to perceive that it is easier to learn and improve attention rates, thus leading to improved learning performance, in particular for lower-achieving students (Chen & Fu, 2003; Moreno & Mayer, 2007; Zywno 2003). Mayer (2003) contends that students learn more deeply from a combination of words and pictures than from words alone; known as the “multimedia effect”. Shah and Freedman (2003) discuss a number of benefits of using visualisations in learning environments, including: (1) promoting learning by providing an external representation of the information; (2) deeper processing of information; and (3) maintaining learner attention by making the information more attractive and motivating, hence making complex information easier to comprehend. Fadel (2008) states that, “students engaged in learning that incorporates multimodal designs, on average, outperform students who learn using traditional approaches with single modes” (p. 13). A major benefit to multimodal design, as identified by Picciano (2009), is that it “allows students to experience learning in ways in which they are most comfortable, while challenging them to experience and learn in other ways as well” (p. 13). The non-linear design of the multimodal learning environment has been found to increase learners’ control over the way that they progress through their materials (Karagiorgi & Symeou, 2005). Thus, students may become more self-directed, interacting with the various elements housed in these environments. Therefore, depending upon their predominant learning style, students may self-select the learning object or representation that best suits their modal preference (Doolittle, McNeill, Terry, & Scheer, 2005). Integral to the design of the multimodal learning environments is the premise that students learn in different ways and that each student has a preferred learning modality (Sarasin, 1999). In other words, “different modes of instruction might be optimal for different people because different modes of presentation exploit the specific perceptual and cognitive strengths of different individuals” (Pashler, McDaniel, Rohrer, & Bjork, 2008, p. 109). This being the case, when learning environments are designed to cater to multiple sensory channels, information processing can become more effective (Kearnsley, 2000). Fundamental to the design of learning environments are the principles of multimodal design in which “information (is) presented in multiple modes such as visual and auditory” (Chen & Fu, 2003, p.350). Although visual images are proven to be an integral part of human cognition, they have tended to be marginalised and undervalued in contemporary higher education (McLoughlin & Krakowski, 2001). If material such as verbal texts (audio), diagrams, drawings, photographs, and videos are all regarded as texts to be read, they can be applied to the development of new inclusive curricula (Roth, 2002). It is necessary to develop strategies for the multiple representation of a whole range of instructional concepts to cater to the diversity of learners we have today. The use of multiple representations, particularly in computer-based learning environments is recognised as a very powerful way to facilitate understanding (Moreno, 2002). For example, when the written word fails to fully communicate a concept, a visual representation can often remedy the communication problem (Ainsworth & Van Labeke, 2002). Some simple examples of multiple representations include, using point-form text or images with audio enhancement in the form of mini-lectures for various topics (Figure 1), interactive diagrams with accompanying transcripts and voiceovers (Figure 2), video presentations, interactive graphs and forms, audio explanations of concepts, and still images. In the examples provided above (Figures 1 and 2), the multimedia elements (visual, aural, and interactive elements) present additional representations of the information traditionally provided in text-based explanations. This approach caters for a range of different learning styles and modal preferences. It gives students choice in how they can access course content, and thus may be considered a more ethical and inclusive response to the needs non-traditional learners. Educators may try to design for all the different learning styles, however limitations exist arise because many students “don’t even realise they are favouring one way or the other, because nothing external tells them they’re any different from anyone else” (DePorter, 1992, p.114). Therefore, although it has been seen that there is a real need to design learning environments to cater for a range of different learning styles and modal preferences to aid student cognition, consideration of students’ metacognition is equally necessary. Therefore, a further aspect needs to be considered, namely, helping individual students become aware of their own preferred approach to learning. It has been suggested that when students are aware of their individual strengths and weaknesses as learners they become more motivated to learn (Coffield, Moseley, Hall, & Ecclestone, 2004). The potential of this awareness is that students can then question their long-held beliefs or behaviours and be taught to monitor their selection and use of a range of strategies to aid their learning (Sadler-Smith, 2001). This strategy has also been shown to increase the confidence and the grades of students by helping them to make the most of the learning opportunities that match their preferred style (Coffield, et al., 2004). To determine their predominant learning style, students can be encouraged to complete some form of learning styles inventory. McLoughlin (1999) emphasises that “teaching students how to learn and how to monitor and manage their own learning styles is crucial to academic success” (p.231). Despite the ongoing call for evidence-based practice, difficulties in assessing the impact of educational technologies on learning outcomes have been reported due to the need to provide all students with the same opportunities (Cronin 2009; Forte & Bruckman 2007; Mayer, 2009). This study sought to address the dearth of experimental studies to test the “meshing hypothesis”; that is, the claim that instructional resources should mesh with the student’s learning style (Pashler et al. 2008, p. 108). The problem investigated in this research was to determine the impact of multiple representations of content on learning outcomes across learning styles and modal preferences. Four research questions were developed to investigate the research problem. 1. Do multiple representations of content lead to improved learning outcomes and does this vary across learning styles and modal preferences? 2. What types of representations of content (visual/aural/text/kinesthetic elements) lead to improved learning outcomes and does this vary across learning styles and modal preferences? 3. Do multiple representations of content lead to cognitive overload, thus reducing learning outcomes and does this vary across learning styles and modal preferences? 4. What is the optimal combination of representations of content for improving learning outcomes and does this vary across learning styles and modal preferences? The main purpose of the research was to establish a cause-and-effect relationship between the ways in which content is presented to students and learning outcomes. Differences across predominant learning styles (visual, aural, read/write, kinaesthetic, multimodal) and modal preferences were also investigated. An experimental design was selected to allow for the manipulation of the ways content was presented and the measurement of students’ learning performance. A post-experiment survey was conducted to identify modal preferences by investigating which learning elements were considered to be most helpful in assisting learning. Undergraduate and post-graduate students studying at the University of Southern Queensland, Australia were emailed to seek their participation in the experiment. An incentive of an AUD$30 university bookshop voucher was used to encourage participation. To determine students’ predominant learning style, students were requested to complete the VARK learning styles inventory online (http://www.vark-learn.com/english/page.asp?p=questionnaire) and to email their VARK scores and result (predominant learning style) to the researchers. The experiment itself involved the development of two learning concepts, both drawn from services marketing theory. 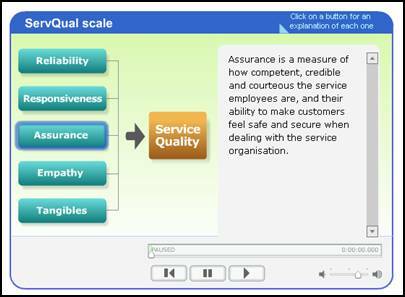 The first concept concerned customer satisfaction and addressed the ‘expectancy disconfirmation model’. 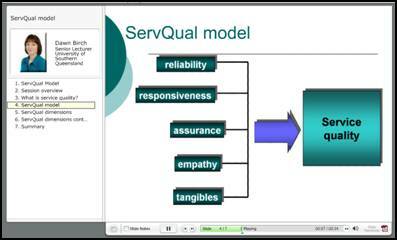 The second concept concerned the measurement of service quality and focussed on the ServQual model. Neither concept is particularly difficult to understand. Students who had previously studied services marketing were excluded from the experiment to control for prior learning. The learning material was presented in six different ways (conditions) with an additional representation of the content being added for each subsequent condition, with Condition 6 representing the highest number of representations of content used in this experiment. (see Table 1). Sixty students were recruited, allowing for ten students in each of experimental groups (each student was exposed to two learning concepts across two different learning conditions), with the aim being to include two students from each of the five learning styles (visual, aural, read/write, kinaesthetic, and multimodal) in each group. However, only four of the students who agreed to participate in the experiment had a predominant aural learning style. The most common learning style from the students agreeing to participate in the experiment were multimodal learners, so where a shortage of students with one of the predominant learning styles existed, a multimodal learner was included to make up the number for each group. The experiment was conducted in two computer laboratories at the University. As students needed to access the multimodal presentations via computer, the learning conditions and the post-experiment survey were housed on a separate website. When the students entered the website, they were instructed to select their assigned group and then follow the instructions in working through the learning conditions. To measure learning and assess prior knowledge or understanding, all students were asked to complete an identical pre-test comprising multiple choice questions for each concept and then to complete a post-test (identical in content to the pre-test) once they had been exposed to each learning concept. To control for confounding factors, a standardised set of instructions, format and setting were used for every group. Students were told that the purpose of the experiment was to measure the impact of various learning resources on learning outcomes and to determine if these varied across learning styles and modal preferences. Students were instructed to carefully work through each learning concept to ensure that they did all of the required reading, listening and interacting with all of learning elements within each condition. Before the commencement of the experiment, students were provided with information about the experiment and asked to sign an informed consent form. Students were assured of anonymity and confidentiality. Demographic data for each participant was gathered from university records including gender, age, program and grade point average. A post-experimental survey was developed to gather students’ perceptions of the learning elements they were exposed to during the experiment. Students were asked which of the two learning concepts they found to be: (a) easiest; and (b) most enjoyable to learn. Six open-ended questions provided all students with an opportunity to express what they felt had been the most helpful resource/s they had been exposed to during their interactions with the two allocated learning conditions and why. These qualitative measures were administered to provide students with the opportunity to give a more in-depth account of their encounter with the multimodal learning environment (Barker, Pistrang, & Elliott, 2002). Of the sixty students participating in the experiment, approximately two thirds (68.4%) were females and one third (31.6%) were males. Students across a broad age range participated in the experiment with the youngest students being 17 years and the eldest student being 60 years. The majority of students were under 30 years of age (70.0%). The proportion of students with each learning style is presented in Table 2. The majority of students in the study had a predominant multimodal learning style (35.0%), with equal numbers of kinaesthetic (21.7%) and read/write (21.7%) learners. Visual (16.7%) and aural (6.7%) learners were under represented in the sample. There were differences in learning styles across gender. The males in the sample predominantly had a multimodal (52.6%) learning style with no visual learners, while females were more evenly distributed across multimodal (26.8%), visual (24.4%), kinaesthetic (22.0%) read/write (19.5%) learning styles. There were very few aural learners in the sample with only 7.3 percent of females having an aural learning style and only 5.3 percent of males. The majority of the students in the sample (60%) had a grade point average of 5.0 or above (out of 7.0) with only 8.0 percent of students with a grade point average of less than 4.0, indicating that very few lower-achieving students elected to undertake the experiment. There were no significant differences across the six experimental groups with respect to gender, age or grade point average. The research problem investigated in this study sought to determine the impact of multiple representations of content on learning outcomes across learning styles and modal preferences. These four themes will be explored in relation to the four research questions, in turn. Research Question 1: The first research question concerned whether multiple representations of content lead to improved learning outcomes and whether this varies across learning styles and modal preferences. The majority of students (93.4%) improved from the pre-test to the post-test after being exposed to the learning materials for Learning Concept 1 with the average change in performance from pre-test to post test being 41.4 percent. Likewise, the majority of students (91.8%) improved from the pre-test to the post-test after being exposed to the learning materials for Learning Concept 2 with the average change in performance from pre-test to post test being 48.3 percent. Learning Concept 1 was perceived to be easier to learn than Learning Concept 2 by the majority of students (58%). However, the majority of students enjoyed Learning Concept 2 (57.39%) more than Learning Concept 1. While students were asked not to guess the answers and to select ‘don’t know’ where they did not know the answer, many students did select both correct and incorrect answers in the pre-test indicating some use of logic and/or guessing. The learning concepts used in the experiment were not difficult, and thus it may have been possible to make a logical assumption or an intelligent guess from the questions asked. The experimental data did not reveal any differences in learning performance across the six groups and the six different conditions for either of the two concepts. This lack of support for the learning style “meshing” hypothesis is consistent with the findings of other experiments conducted by Massa and Mayer (2003) and Constantinidou and Baker (2002). However, it should be emphasized that the sample sizes (ten per cell) were too small to make any statistical inferences. Moreover, some methodological limitations were evident including the lack of participants with aural and visual learning styles, the possibility that the concepts were too simple or common sense resulting in inflated pre-test scores due to correct guessing and/or logic, the unnatural research setting, possible testing effects, and self-selection of students with higher average grade point averages (the average GPA of the participants was 5.06/7.00). Given the literature indicates that multimodal learning may be of greater benefit to lower-achieving students, while higher achieving students perform well regardless of how the content is presented, this could provide some explanation for the lack of impact of multiple representations of content on learning performance within this experiment (Zwyno, 2003). Research Question 2: The second research question sought to determine which types of representations of content (visual/aural/text/kinaesthetic elements) lead to improved learning outcomes, and whether this varies across learning styles and modal preferences. While there were no differences across learning performance, most students indicated that all of the learning resources were helpful with the more enhanced multimodal learning resources considered to be the most helpful. Using the Friedman test, a ranking of the treatments was possible as indicated in Table 3. This finding indicates that the enhanced PowerPoint with audio and interactive diagrams with audio and transcript were significantly different to the other learning resources, with these two resources being considered to be the most helpful to the student learning experience. These two elements (included in condition 6) comprise greater representations of content and include visual, aural, text-based and kinaesthetic elements, aimed at appealing to a variety of learning styles and modal preferences. While the sample is too small to draw any statistical inferences, the data indicates (Table 4) that kinaesthetic learners, in particular, found the recorded PowerPoint presentations to be very helpful, while aural learners found the interactive diagram with transcript and audio to be very helpful. It is also interesting to note that the visual and kinaesthetic learners rated the textbook reading as being the least helpful, while the aural and read/write learners rated the interactive diagram with audio only as being the least helpful. This could indicate that visual and kinaesthetic learners may be at some disadvantage when the learning resources are primarily text-based. Students were also asked open-ended questions concerning the various learning resources. Responses indicated that students have modal preferences for learning, and in many cases, in keeping with their predominant learning style. Many students commented on how the various learning resources assisted them in understanding and retaining the content, while others commented on which learning resources were easiest, more interactive or more enjoyable to use. A selection of student comments, across the various learning styles, is provided in Table 5. § I did not enjoy Learning Concept 2 as there was no audio or diagrams. I find learning easier with additional aids. § The most helpful is the diagram with script and audio as there are two different modes of learning available. § It is hard to focus on reading the text for a long time. Interactive learning is easy and more importantly it is enjoyable. Having seen that there can be some concerns around having too much choice, albeit that these comments are very much in the minority, there is sufficient evidence to suggest that a scaffolded approach, utilising a combination of learning materials (a multimodal approach) to the provision of key information may be optimal. Pashler, et.al. (2008) state that “It is undoubtedly the case that a particular student will sometimes benefit from having a particular kind of course content presented in one way verses another” (p. 116). Hence, a choice of resources and the reinforcement that choice allowed were fundamental to the students’ appreciation of the learning environments. The main finding here may be that students like to have options and will gain benefits from those learning styles most suited to their learning style or modal preference. While the experimental data for this study did not indicate that students perform better under multiple representations of content, the qualitative data clearly indicates that students have modal preferences for learning and perceive learning resources with higher representations of content to assist their comprehension, understanding and retention of content, and to be more interesting and enjoyable to use. In particular, students expressed a strong preference for a combination of learning resources and options. Given these findings, the importance of improving student progression and retention, and engendering a joy of learning leading to life-long learning, educators should be encouraged to continue to explore the use of educational technology and multimedia for developing multiple representations of content. Recorded PowerPoint presentations and interactive diagrams with transcripts and audio, in particular, were valued by students in this study. A number of limitations should be considered before drawing conclusions from this exploratory experimental study. First, it is difficult to make any inferences from the quantitative data regarding the impact of providing multiple representations of content on learning performance due to small sample and limitations of the experimental methodology. In addition to the small sample size, there was a predominance of: (1) higher-achieving students; (2) multimodal learners who typically learn across a range of conditions; and (3) a lack of aural and visual learners in the sample. Given the literature indicates that multimodal learning may be of greater benefit to lower-achieving students, while higher achieving students perform well regardless of how the content is presented, this may be one factor that explains the lack of impact of multiple representations of content on learning performance within this experiment (Zwyno, 2003). Future research should involve a larger sample, higher representation of lower-achieving students, and a more even representation across learning styles. Future research could also involve more complex concepts to allow for a stronger measure of improvements in learning performance across pre and post tests. A larger and more representative sample could be recruited to allow for an empirical investigation of the impact of using educational technologies for developing multimodal learning resources across various groups. For example, in addition to exploring differences across learning styles and modal preferences, differences across gender and age groups, lower versus higher achieving students, English Second Language (ESL) versus English First Language students (EFL), and on-campus versus distance learners could also be investigated. Moreover, the unnatural study conditions and difficulties in controlling for extraneous factors in an experimental design should be addressed (Sekaran, 1992). Ideally, future research would involve investigating learning performance under more natural study conditions to reduce possible testing effects. Under experimental conditions, students may be more actively involved in processing the learning content and pay greater attention to the content than they would in real life. The difficulties experienced with the experimental methodology in this study may provide some explanation for the dearth of empirical data on the impact of multimodal presentation of content on learning styles, despite calls from educators for evidence that technology-enhanced learning leads to improved learning outcomes. Ainsworth, S., & Van Labeke, N. (2002). Using a multi-representational design framework to develop and evaluate a dynamic simulation environment, paper presented at the International Workshop on Dynamic Visualizations and Learning, Tubingen, Germany. Barker, C., Pistrang, N., & Elliott, R. (2002). Research methods in clinical psychology: An introduction for students and practitioners (2 ed.). West Sussex: John Wiley & Sons Ltd.
Birch, D., & Burnett, B. (2009). Advancing E-Learning Policy and Practice: Influences on Academics’ Adoption, Integration and Development of Multimodal E-Learning Courses. In Institutional Transformation through Best Practices in Virtual Campus Development: Advancing E-Learning Policies. Birch, D., & Gardiner, M. (2005). Students' perceptions of technology-based marketing courses, paper presented at the ANZMAC 2005 Conference: Broadening the Boundaries, Fremantle, Western Australia, 5-7 December. Birch, D., & Sankey, M. (2008). Factors influencing academics’ development of multimodal distance education courses. International Journal of Educational Development using ICT, 4(1). Chen, G., & Fu, X. (2003). Effects of multimodal information on learning performance and judgment of learning. Journal of Educational Computing Research, 29(3), 349-362. Coffield, F., Moseley, D., Hall, E., & Ecclestone, K. (2004). Should we be using learning styles? What research has to say to practice? London: Learning and Skills Research Centre. Constantinidou, F., & Baker, S. (2002). Stimulus modality and verbal learning performance in normal aging. Brain and Language, 82, pp. 296-311. Cronin, J. J. (2009). Upgrading to Web 2.0: An experiential project to build a marketing Wiki. Journal of Marketing Education, 31(1), 66-75. DePorter, B. (1992). Quantum learning: Unleashing the genius in you. New York: Dell Publishing. Doolittle, P. E., McNeill, A. L., Terry, K. P., & Scheer, S. B. (2005). Multimedia, cognitive load and pedagogy. In S. Mishra & R. C. Sharma (Eds.). Interactive multimedia in education and training (pp. 184-212). London: Idea Group, Inc.
Fadel, C. (2008). Multimodal Learning Through Media: What the Research Says. San Jose, CA: Cisco Systems. Fahy, P. J. (2005). Planning for multimedia learning. In S. Mishra & R. C. Sharma (Eds. ), Interactive multimedia in education and training (pp. 1-24). London: Idea Group Inc.
Fleming, N. D. (2001). Teaching and learning styles: VARK strategies. Christchurch, New Zealand: Neil D Fleming. Forte, A., & Bruckman, A. (2007). Constructing text: Wiki as a toolkit for (collaborative?) writing, paper presented at the 2007 International Symposium on Wikis (WikiSym ’07), Montreal Canada, Oct 21-23 (pp. 61-68): New York, Association of Computing Machinery. Hazari, S. (2004). Applying instructional design theories to improve efficacy of technology-assisted presentations. Journal of Instruction Delivery Systems, 18(2), 24-33. Karagiorgi, Y., & Symeou, L. (2005). Translating constructivism into instructional design: Potential and limitations. Educational Technology & Society, 8(1), 17-27. Kearnsley, G. (2000). Online education: Learning and teaching in cyber space. Belmont, CA: Wadsworth/Thomson Learning. Massa, L. J., & Mayer, R. E. (2006). Testing the ATI hypothesis: Should multimedia instruction accommodate verbalizer-visualizer cognitive style? Learning and Individual Differences, 16, 321-336. Mayer, R.E. (2009). Advances in applying the science of learning and instruction to education. Psychological Science in the Public Interest, 9(3), i-ii. Moreno, R., & Mayer, R. (2007). Interactive multimodal learning environments. Educational Psychological Review, 19, 309-326. McLoughlin, C., & Krakowski, K. (2001). Technological tools for visual thinking: What does the research tell us?, paper presented at the Apple University Consortium Academic and Developers Conference, James Cook University, Townsville, Queensland, Australia, September. Moreno, R. (2002). Who learns best with multiple representations? Cognitive theory implications for individual differences in multimedia learning, paper presented at the EDMEDIA 2002 Conference: Denver, Colorado, USA, June. Omrod, J. E. (2008). Educational psychology: Developing learners (6th ed.) Upper Saddle River, NJ: Pearson. Pavio, A. (1991). Dual coding theory: retrospect and current status. Canadian Journal of Psychology, 45, 255-287. Picciano, A. G. (2009). Blending with purpose: The multimodal model. Journal of the Research Centre for Educational Technology, 5(1), 4-14. Roth, W. M. (2002). Reading graphs: Contributions to an integrative concept of literacy. Journal of Curriculum Studies, 34(1), 1-24. Sadler-Smith, E. (2001). The relationship between learning style and cognitive style. Personality and Individual Differences, 30(4), 609-616. Sankey, M., & St Hill, R. (2009). The ethics of designing for multimodality: Empowering nontraditional learners. In U. Demiray & R. Sharma (Eds. ), Ethical Practices and Implications in Distance Education (pp. 126-155). London: Ideas Group International. Sarasin, L. C. (1999). Learning styles perspectives: Impact in the classroom. Madison, WI: Atwood Publishing. Sprague, E. W., & Dahl, D. W. (2009). Learning to click: An evaluation of the personal response system clicker technology in introductory marketing courses. Journal of Marketing Education, 32(1), 93-103. St Hill, R. (2000). Modal preference in a teaching strategy, paper presented at the Effective Teaching and Learning at University, Duchesne College, The University of Queensland, November. Weston, T. J. (2005). Why faculty did - or did not - integrate instructional software in their undergraduate classrooms. Innovative Higher Education, 30(2), 99-115. Zywno, M. S. (2003). A contribution to validation of score meaning for Felder-Solomon’s Index of Learning styles. Proceedings of American Society for Engineering Education Conference and Exposition. Dr Dawn Birch is a Senior Lecturer in Marketing at the University of the Sunshine Coast, Queensland, Australia. Dawn holds a Doctorate in Education from the Queensland University of Technology. Her doctoral thesis focused on the development of e-learning environments. Research in the field of e-learning has included investigation of educators’ motivations for developing e-learning environments and students’ perceptions of multimodal courseware. Her current research interests include e-learning formats, multimodal delivery, sustainable service delivery processes and consumer behavior. Dawn has published in the fields of educational technology, marketing education, international advertising and countertrade. Dawn currently teaches marketing courses at both the undergraduate and postgraduate levels. In 2003, Dawn was a recipient of the Australia and New Zealand Pearson Education ANZMAC (2003) Marketing Educator of the Year Award. Dr Michael Sankey is currently the Director of the Learning and Teaching Support Unit at the University Southern Queensland (USQ) in Australia. He specialises in the areas of e-learning pedagogies, multimodal and web design, visual and multiliteracies. He also chairs the key university committee that oversees the core ICT-based systems used to support learning and teaching. His recent research has focused on the multiple representation of concepts when utilising multimedia and Web 2.0 technologies, and how the use of hybridized or blended electronic environments can enhance learning opportunities for students, particularly for those studying at a distance. With a background in art and design he is passionate about the ways in which aesthetically enhanced learning environments can better transmit concepts to students of all backgrounds. Michael is an active member of the Australasian Society for Computers in Learning in Tertiary Education (ASCILITE), and is a life member of the International Visual Literacy Association (IVLA). Michael Gardiner is a lecturer at the University of Southern Queensland where he teaches marketing. Michael is also recognised by the marketing industry obtaining his Qualified Professional Market Researcher ad and Certified Professional Marketer status with the key professional marketing bodies in Australia. His research interests are marketing education, market and social research best practice, and the use of technology and data analysis.